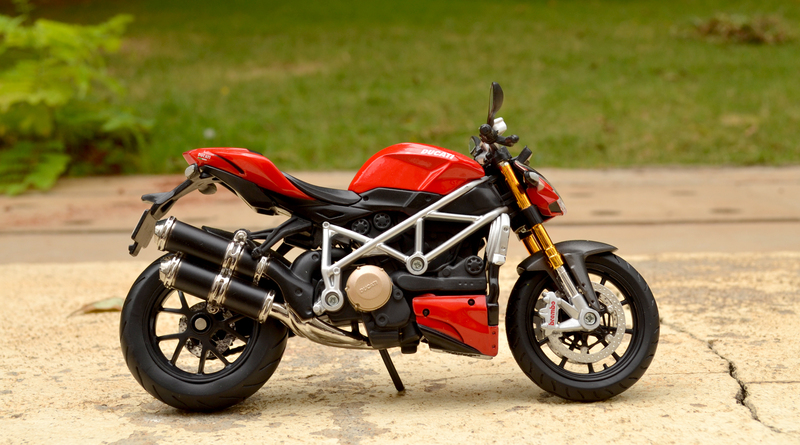 The Ducati Streetfighter is a streetfighter-style motorcycle produced by Ducati. The Streetfighter’s Superbike soul combines fighter attitude and naked sophistication to create pure adrenaline. 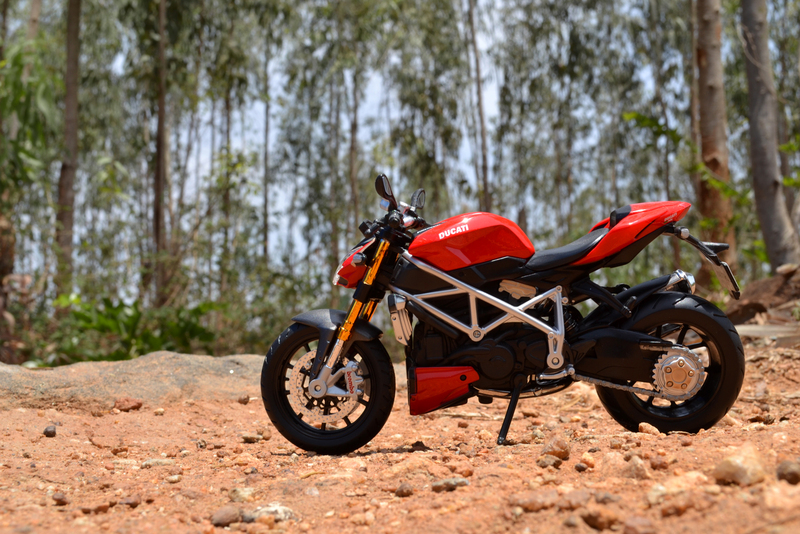 The ‘S’ treatment of the Streetfighter pushes its tech spec to the red line. Öhlins suspension front and rear and lightweight Marchesini forged wheels, super-light carbon fibre front fender help reduce the dry weight. Its also gets traction control and data analysis are standard issue. 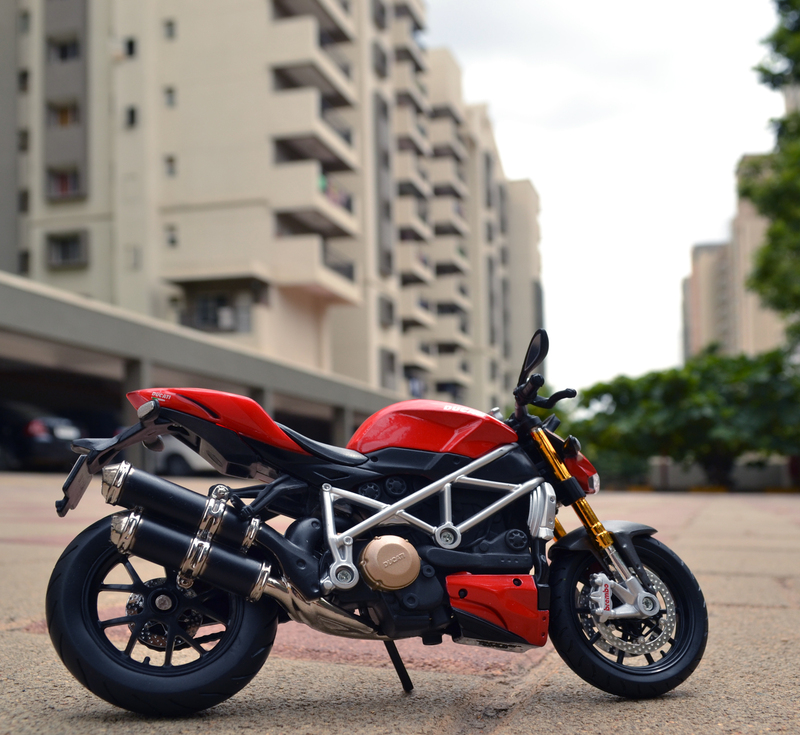 So what is a Streetfighter?? It is a stripped sport bikes fitted with higher bars and customisation to create high-performance! Why is this Streetfighter Special? 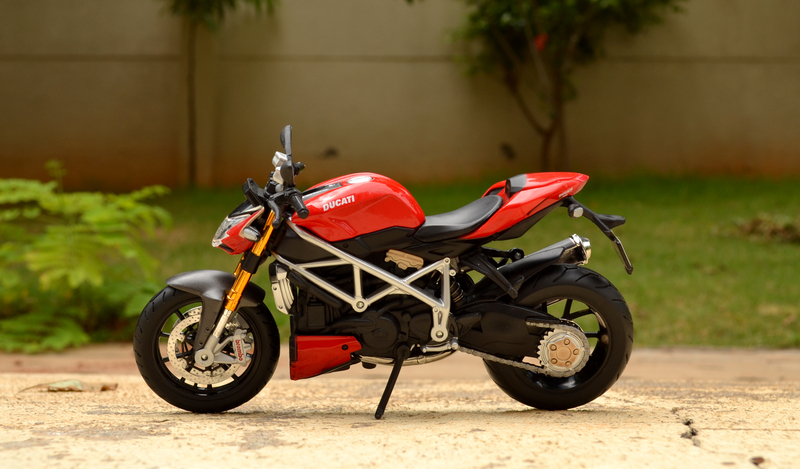 I am one brain dead Ducati Aficionado who would go for anything that holds a badge that says Ducati!! 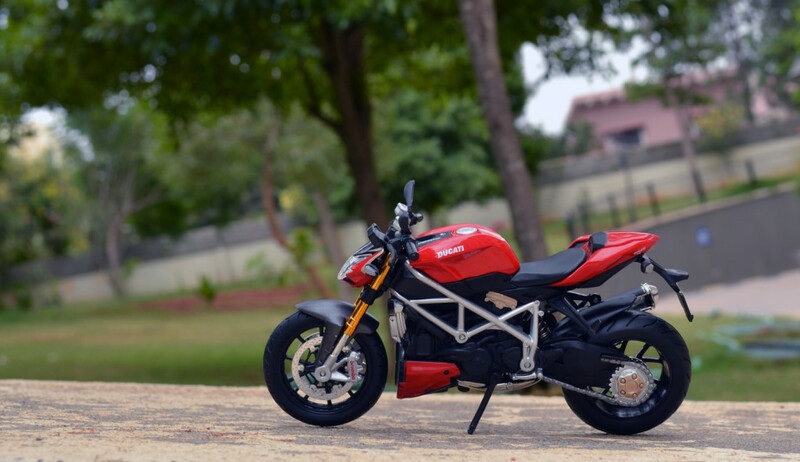 Basically there are two reasons why I love this bike… One is the love for Ducati’s bikes in red, I have around 10 Ducati, all in color red!! So I have to add this into my collection..its a mandate. 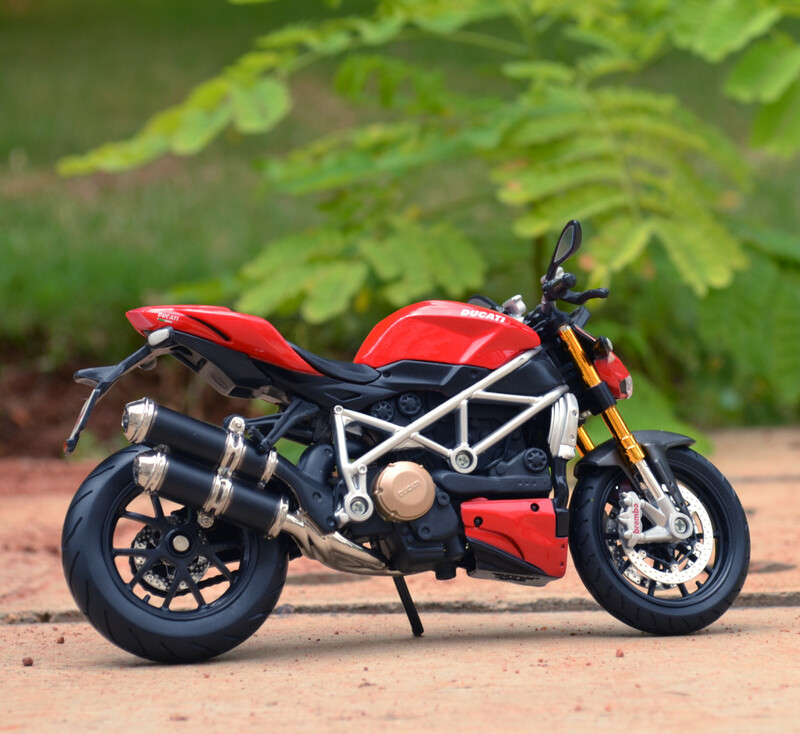 Second reason is that I wanted an Automaxx Streetfighter in 1:12 scale but those model are not available in India and importing is getting really expensive! So when I first saw this model in stores shelves, I immediately jumped in. Thought this Maisto is no match for the Automaxx’s quality but still a worthy opponent! When it comes to packaging Maisto score the most in my books… Their box for the 1:12 Bike models are easier to unbox… No screw to worry or tigh strings to tangle yourself with! Going gets easlier when you want to repack and store because of its not stay feature. 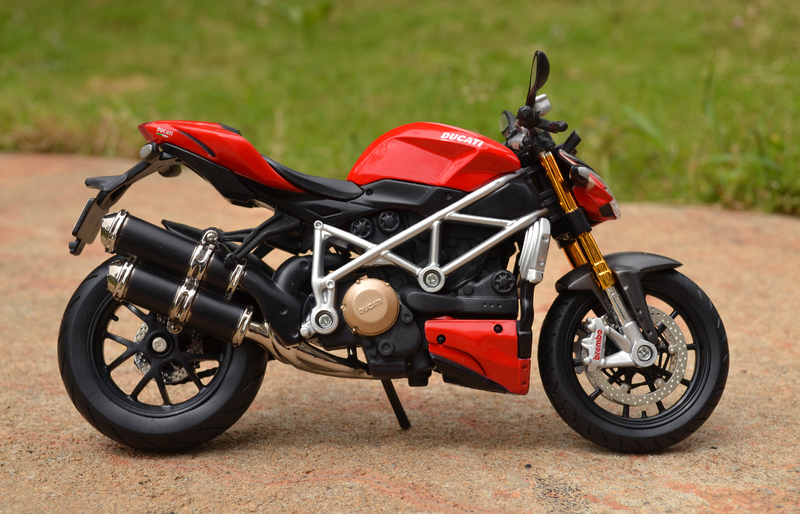 Out of the box this Streetfighter is a looker as is the real deal! The bright red paint finish is major attention grabber that can start a conversation and take it to any further levels. The next talk point is its trellis frame finished in aluminum shade, As most serious collectors would say The Devil is in the Detailsthough a little off scale for this 1:12 but very very nice to look at…even from a distance. As most serious collectors would say “The Devil is in the Details” and the premium brands charge a bomb for such a details… But budget brands like Maisto are also getting there(may be in their own way) with model like this Ducati Streetfighter S. Take the engine cover in bronze shade with the “Ducati” engraved in it, “Brembo” monogram in the front brake calipers and also the “DUCATI” monogram in the rear seat cowl! Bronze detailing continues on the wheel hub in single sided swing arm and also the engine head on the left side. Though the rear view mirror are just a reflective sticker it is so shiny I can see some great reflection of the tarmac behind while photographing outdoor. 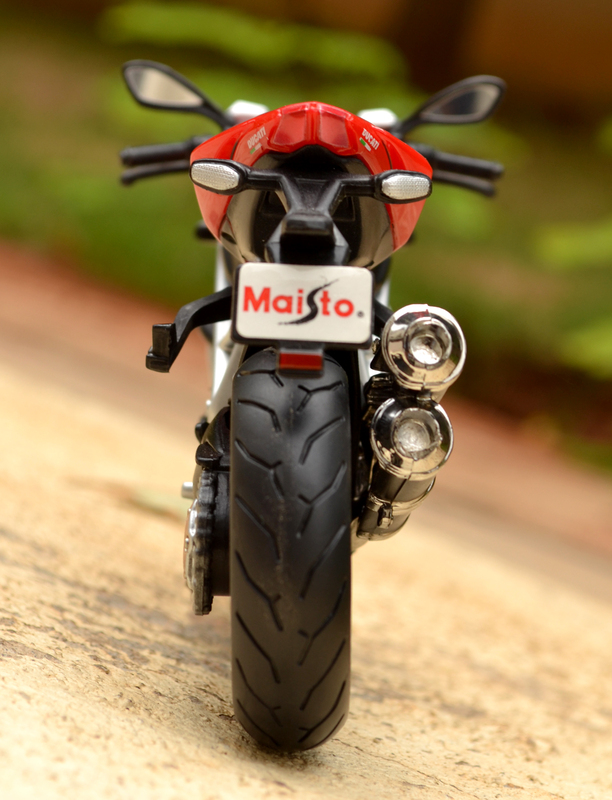 Though a very matured model from Maisto has an array of issues that any 1:12 scale model bikes they always had! The indicators optics have not seen any update in ages!! Still those painted bit for the tail lamps. Overscaled brake calipers and no brake calipers at all at the rear! 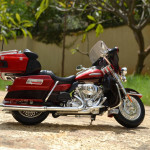 The exhaust ends up sealed as there is no hole to add that extra oomp…this is even add by NewRay ages back, why Maisto? Why? One other open item in Maisto’s defect plate is the screws that they use…they have consistently grown with the age! Why to even use such a bulky screws when they don’t use any screws in their 1:18 scale bike line up? These are mere findings but not a deal breaker to any level.. I can always live with them but would be great if they are sorted! The head lamp assembly itself is a work of art by Maisto! 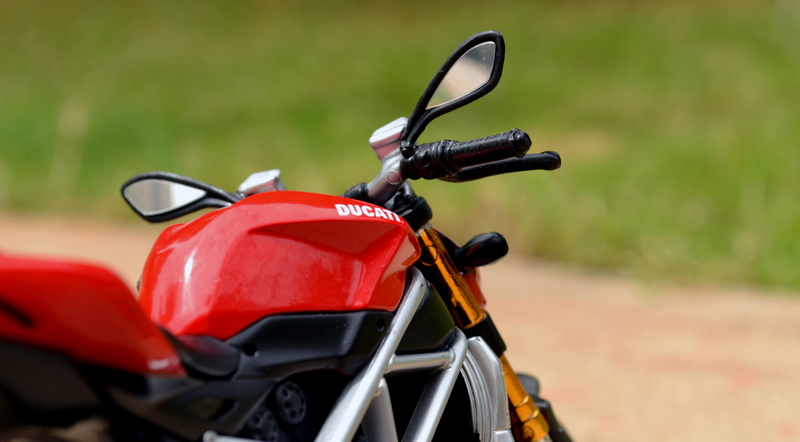 The DUCATI monogram above the head lamp, main beam lensing and even the park lamp detailing is not left untouched. 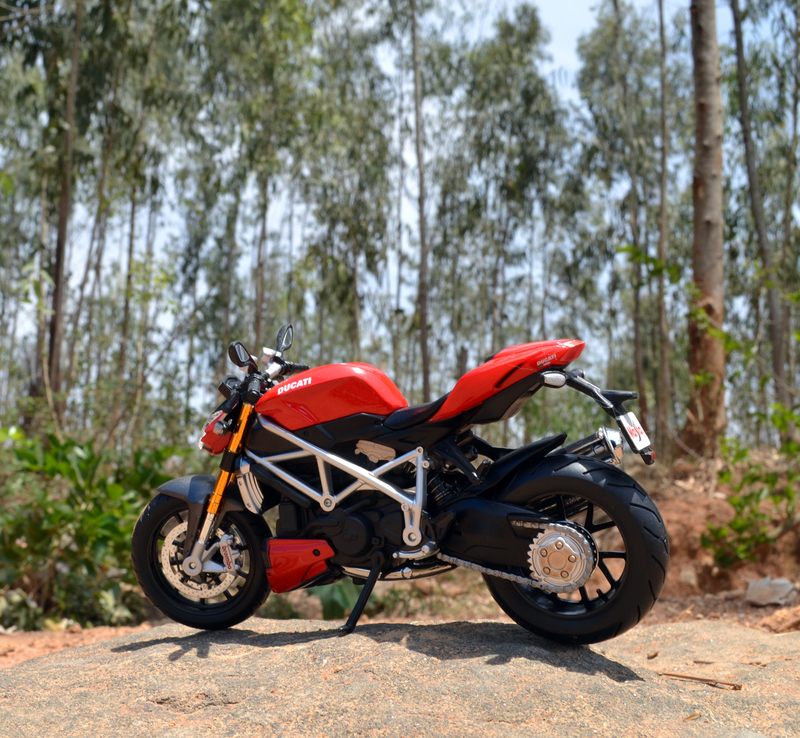 Being a red Ducati it blends in very well proudly flashing pose as all Ducs do. I managed to take it out an few trips and this guys gets along quite well, no matter its the multi storied residential complex or a thick bamboo plantation. 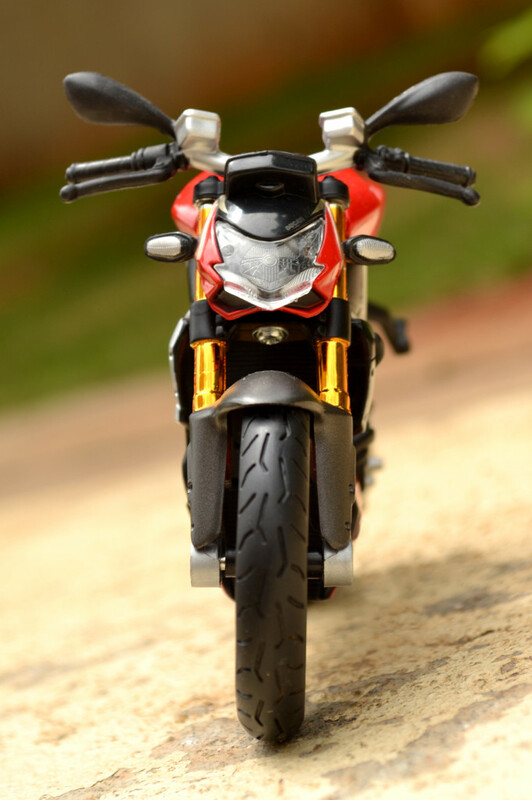 I really enjoy doing photo sessions with this Duc hope you would like it too. So finally its verdict time! 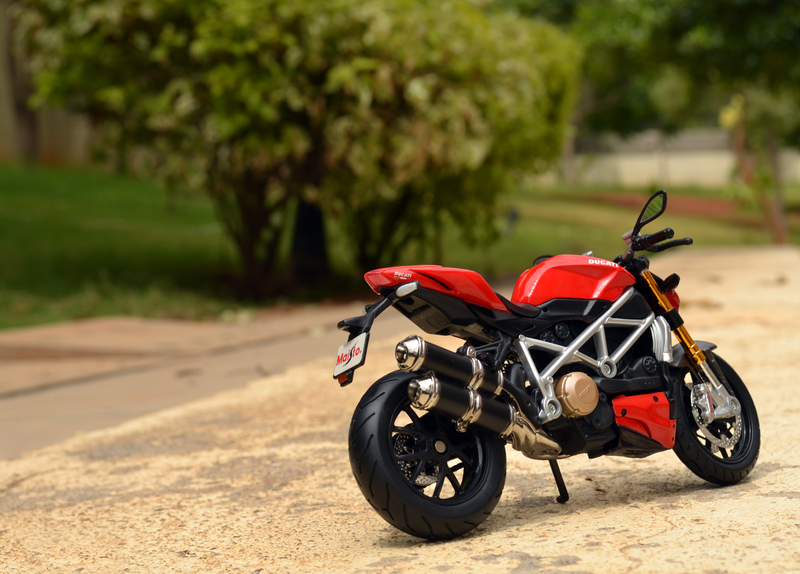 This Ducati Streetfighter S is one of the best Masito to date in 1:12 scale! 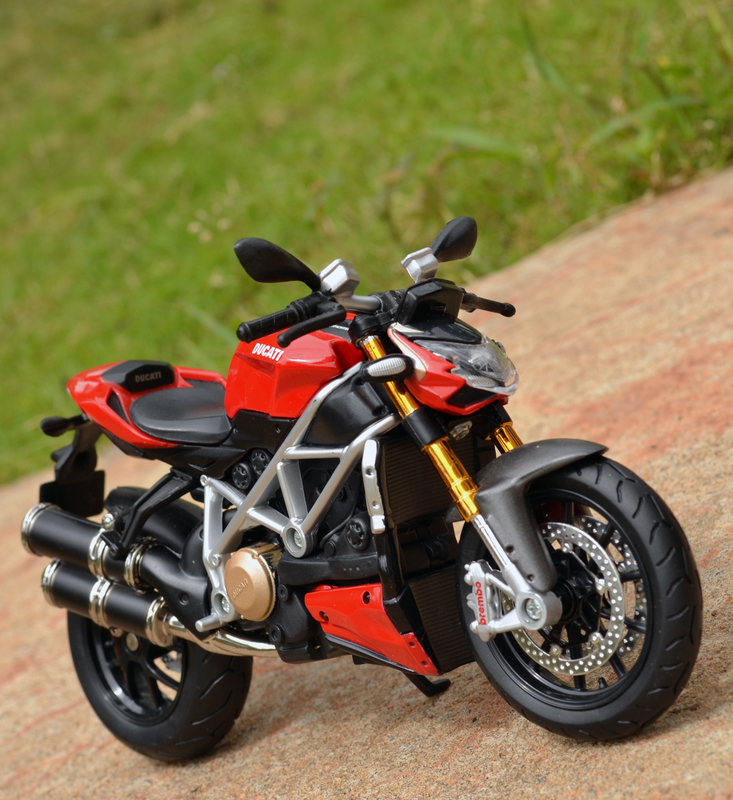 As I said earlier I would die to get an Automaxx Streetfighter but this Maisto at a fraction of its price is so good infact too good pegged right next my other Automaxx stares a pose with confidence! If you have resource to procure an Automaxx then think no further(I anyways will get my hands on Automaxx one soon) at the same time I would recommend this as it is a ‘S’ variant and would go very well too. This model scores a respectable 4.5/5 for the attention to details and paint finish. Maisto really did a good job on this replica. I have one also, and it’s one of my favorite models in my collection. Great job as always on the pictures. !